NMM 4342. Hardingfele by Olav Lomundal, Norway, 1966. Arne B. Larson Collection, 1979. NMM 4557. Hardingfele, Norway, 18th/19th century. Four melody, four sympathetic strings. Later pegbox and scroll grafted onto original neck. Arne B. Larson Estate, 1988. NMM 14465. Hardingfele by Knudt Eriksen Helland, Bø, Telemark, Norway, 1873. Gift of Bonnie Weiger, Laurel, Nebraska, 2010. NMM 6125. Hardingfele, Telemark style, Norway, ca. 1880. Four melody, four sympathetic strings. Traditional dragon-head finial. Later back. Ex coll. : Halvor Lee, Spirit Lake, Iowa. Gift of Mary L. Fawkes, Ames, Iowa, 1998. NMM 11297. Hardingfele, Norway, ca. 1880-1910. Paul and Jean Christian Collection, 2006. NMM 4558. Hardingfele by Anders Heldahl, Bergen, Norway, 1886. 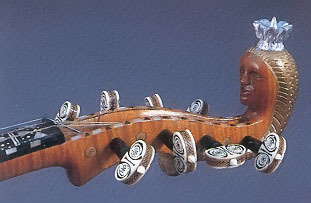 Hardingfele body with later violin neck, pegbox, and scroll. Arne B. Larson Estate, 1988. NMM 1139. Violin in style of hardingfele by Knud K. Hougen, Inwood, Iowa, 1895. Number 21. Four strings. Traditional dragon-head finial. Arne B. Larson Collection, 1979. NMM 4556. Hardingfele by Gunnar Olavsson Helland, Bø, Telemark, Norway, 1895. Four melody, four sympathetic strings. Traditional dragon-head finial. Arne B. Larson Estate, 1988. NMM 5064. Hardingfele by Knut Nilsen Øvretveit, Lindås, Nordhordland, Norway, 1898. 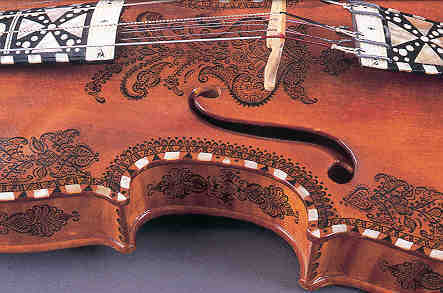 Hardingfele body with later violin neck, pegbox, and scroll. Arne B. Larson Estate, 1988. NMM 5065. Hardingfele by Endré Endresen Sandland, Brunkeberg øvre Telemarken, Norway, 1901. Four melody, four sympathetic strings. Traditional dragon-head finial. Arne B. Larson Estate, 1988. NMM 4824. Hardingfele by Knut Ø. Rudi, Valdres, Øystre Slidre, Norway, 1906. Four melody, four sympathetic strings. Traditional dragon-head finial. Gift of Frederick Thomas and Marion Packard van Urk, Palo Alto, California, 1989. NMM 4928. Hardingfele by Gunnar Olavsson Helland, Bø, Telemark, Norway, 1908. Four melody, four sympathetic strings. Traditional dragon-head finial. Gift of Dr. and Mrs. Wayne S. Knutson, Vermillion, South Dakota, in memory of Elias Johnstad (1889-1957), who formerly owned and played the instrument, 1990. NMM 5063. Hardingfele by Anders Odegaarden, Drammen, Norway, 1909. Four melody, four sympathetic strings. Traditional dragon-head finial. Arne B. Larson Estate, 1988. NMM 1269. Hardingfele by Lars H. Savill, Gaupljolm, Norway, 1931. Four melody, five sympathetic strings. Human-head finial. Arne B. Larson Collection, 1979. NMM 4344. Hardingfele by O. Løseth, Fannrem, Norway, 1961. Four melody, four sympathetic strings. Human-head finial. Arne B. Larson Estate, 1988. NMM 4342. Hardingfele by Olav Lomundal, Hoston Orkdal, Norway, 1966. Four melody, four sympathetic strings. Human-head finial. Arne B. Larson Estate, 1988. Lit. : André P. Larson, The National Music Museum: A Pictorial Souvenir (Vermillion: 1988), p. 53. Frannie Biebl, "Fiddle of the Fjords," Viking, Vol. 97, No. 9 (October 2000), pp. 48-49.